Fort Worth’s downtown public square project has grown from a need to configure a bus transfer center near the City’s government center and the idea developed by PPS to locate stops for different routes around a concentrated area of streets, underused spaces and civic buildings (instead of at one centralized facility) to stimulate dynamic pedestrian activity. The concept, which PPS then expanded to bring together six different open spaces to create a civic square, was evolved as part of a nationwide program PPS is conducting with the Center for Urban Development of the General Services Administration to integrate government buildings within their communities and make their public spaces more attractive, inviting and vibrant. 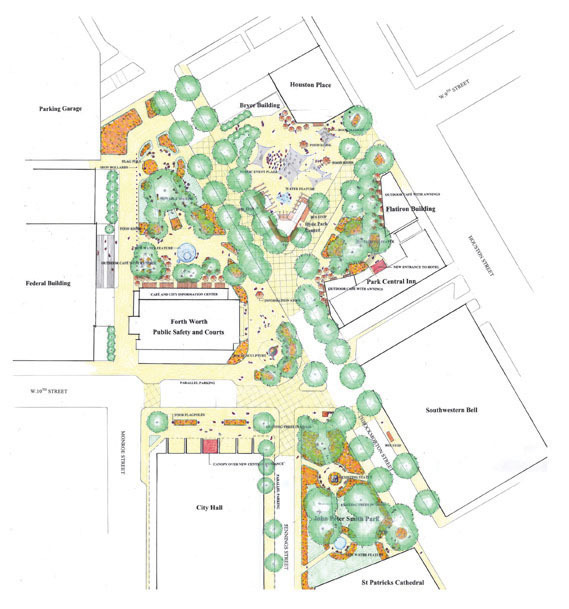 The plan includes a park-like setting for lunchtime use, with food and information kiosks; a public plaza large enough for events, such as performances or a market, with trees and a stage; a quiet garden-like area with gazebo and café; an entrance plaza for city hall with fountains and a café; a major focal space with a large sculpture; and a formal garden, as well as narrower streets to slow traffic and facilitate pedestrian crossings and the bus stops located close enough to each other to make transfers easily and invite walking.